This is the Lotus Blossom tank from the latest issue of Interweave Knits. I am knitting it with Knitpicks Shine. It is cotton and modal and is so soft. I spent a lovely afternoon on thursday with friends at the Blues Festival in Grant Park knitting this and listening to great music. Unfortunately it rained all last night and is chilly today and they will really be feeling the blues at the festival today. We will be off to Ty's Origami Society meeting instead, where I will be making more progess with my knitting. Yummy. I love Modal and hope to see it become more widely available (and cheaper). I have Modal sheets and it's like sleeping on silk!! Your Saturday sounds perfect! There are some things I do miss about Chicago....but the traffic and noise are not among them. 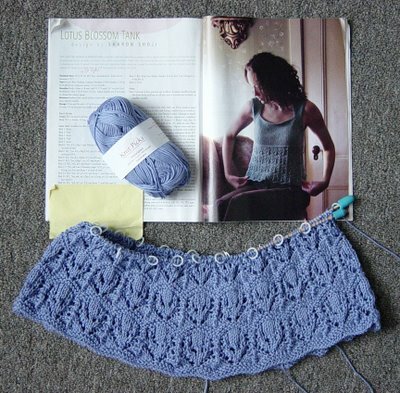 I'm loving watching your knitting progress! Your hand dyed yarn is truly delicious to the eye.